Posted by Maria Perilli on January 14, 2013. For each unique business you handle PPC management for, there is a unique set of challenges related to their target audience. One of the most challenging is the over 65 market. Over the past 10 to 15 years, this particular market segment has statistically spent less time online than others, and was also less likely to make purchases online. Despite these statistics, as the baby boomer generation grows older, there is ample opportunity for online marketers to target those over the age of 65. By 2030, the number of Americans age 65 and older is expected to grow to 70 million. According to a study by Google, more than 84 percent of seniors are browsing the Internet and conducting searches on multiple devices. One-third of the current population over the age of 65 has entered a search query on their mobile device within the last 30 days, and 78 percent of those who were exposed to an online video ad conducted a branded search for the advertiser after viewing their ad. The marketers who are taking the most advantage of this growing online market are Medicare and life insurance companies, using pay per click marketing as one of their chief lead generation tactics. Our team has been managing the PPC marketing for one major company whose target audience is over 65. What we’ve discovered is that one of the most important tools to our success has been providing ample information. A recent study conducted by Google and comScore, a leader in digital business analytics, on the healthcare industry shows that, on average, seniors clicked 7 links per browsing session before making a decision. We make sure to provide a wealth of information on our customers’ products and services in order to answer as many questions as possible in an effort to keep them on the site as long as possible and increase the possibility of conversion. We also ensure that our online efforts are tied to our client’s direct mail and other offline marketing initiatives. This consistency is incredibly important, as those over 65 are the highest respondents of direct mail. With this increasingly lucrative market, PPC Professionals is making it a point to cater to their unique online experience, taking advantage of the currently low barrier of entry. 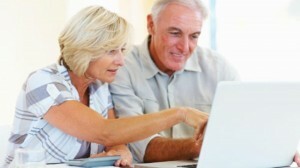 Have any other great tips for marketing to the booming over 65 generation? Let us know what tactics you are using in the comments below!